To judge the strict factual accuracy of LePage’s statement, we’d need contents of the three-ring binder in order to crunch the numbers on the arrests between, “ever since I said that comment,” (January 6, 2016,) and August 24th. Furthermore, we’d want to confirm the veracity and accuracy of the three-ring binder: does it in fact contain information on “every single drug dealer who has been arrested in our state” in that time period? And we’d want to spend a little time in LePage’s head: is he quoting a hard number, 90%, or is he relating the impression he had after flipping through the binder of mug shots? To be fair, Americans do apparently often overestimate the proportion of blacks and hispanics in the population. But you can’t just let the Governor of the state off on a technicality. 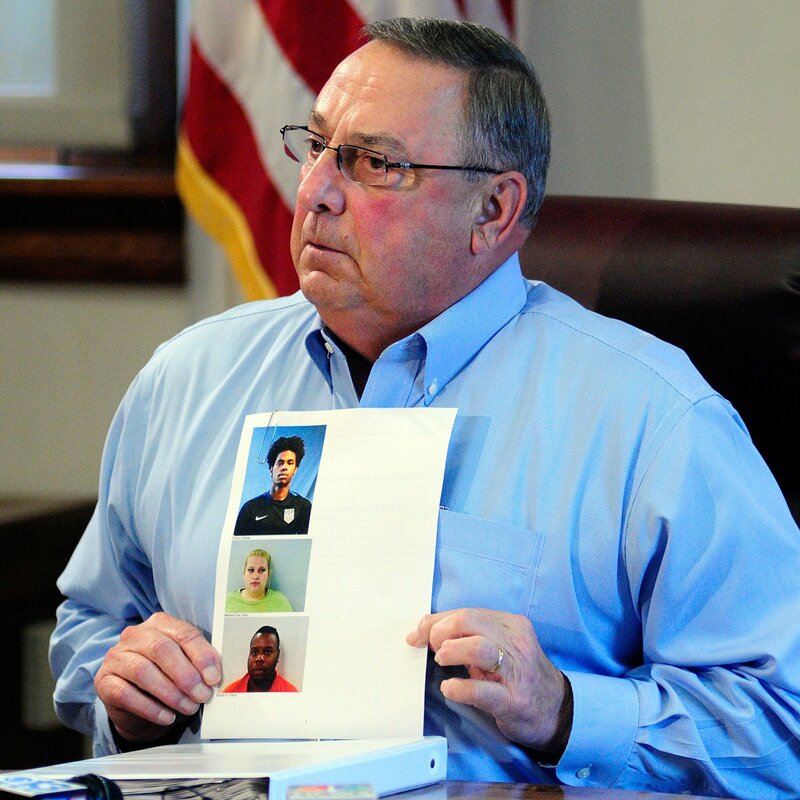 The image LePage is putting out there by talking about ‘D-Money, Smoothie, and Shifty knocking up white Maine girls,’ and now the unfounded ’90-plus percent’ figure, is that non-whites from away are the main villains responsible for the drug problem in Maine. He’s even gone as far as to say, “I tell ya, everybody in Maine, we have constitutional carry … Load up and get rid of the drug dealers. Because, folks, they’re killing our kids.” [source] So he’s playing a dangerous game here, painting a picture of what a drug dealer looks like– putting a profile out there –and then calling on vigilantes to commit murder. First, as discussed above, LePage is promoting an image of black and Hispanic drug dealers plaguing Maine and corrupting our young white women. One of the oldest, racistist tropes in the book. On one hand, police have said that out-of-state gangs are a piece of the drug trade here. But on the other, a 2015 study from the Muskie School of Public Service at the University of Southern Maine found racial bias in Maine’s juvenile justice system. LePage is either lying intentionally to paint blacks and Hispanics as the bad guys, or he’s willfully ignorant of the actual figures and potential racial biases at work in the state’s criminal justice system. What type of person would be thus untruthful, or so blind? There is an underlying issue here. Using the Department of Corrections Prisoner Search service, at the time of this writing, we find of 9155 total adult prisoners and probationers in the Maine Department of Corrections system, 8089 (or 88%) have a race/ethnicity of white. Though not as pronounced as the 70% white among those incarcerated for drug trafficking, the overall numbers are still out of whack when compared to census data which shows the state population to be 95% white. The Bangor Daily News article quoted above mentions a Muskie School of Public Service study that a found racial bias in Maine’s juvenile system. When the dust from all of this political grandstanding settles, will the likes of LePage and Gattine allow the adult justice system go unexamined?